Q: Is it illegal to carry pepper-spray in Trinidad and Tobago? A: Yes it is. According to Section 2 of the Firearms Act 1970, a "prohibited weapon" includes "any weapon of whatever description or design which is adapted for the discharge of any noxious liquid, gas or other thing." 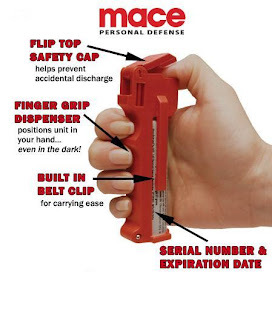 While myself and others think legalising pepper-spray (to be used ONLY for SELF-DEFENCE) is an excellent idea -especially for the protection of women- Trinidad and Tobago along with many other countries in the world continue to keep it illegal. Despite the illegality of the product, many women still carry it, with the Indonesian capital, Jakarta, endorsing its use by women for their protection against rapists. N.B: Mace is not an alternative to Pepper-Spray; instead, it is the name of the company that invented it and remains the market leader.